The U.S. Occupational Safety and Health Administration (OSHA) has a set of labeling guidelines in place for chemicals being used, stored or otherwise handled in laboratories. Whether it’s a medical, clinical, industrial or academic lab, laboratories of all shapes and sizes frequently house a variety of potentially dangerous chemicals. These chemicals may include carcinogens, irritants, corrosives, sensitizers, hepatotoxins, nephrotoxins, neurotoxins, and highly acidic substances. In an effort to protect workers from the negative effects of such chemicals, the OSHA has a set of rules in place regarding the labeling of lab chemicals. Is There an OSHA Standard For Lab Chemicals? Before we go into the exact labeling requirements for lab chemicals, it’s important to note that the OSHA has a standard — Title 29 of the Code of Federal Regulations (CFR) 1910.1450, Occupational Exposure to Hazardous Chemicals in Laboratories — in place for lab chemicals. Lab managers and employees can refer to this standard to learn more about what’s acceptable and what’s not in a lab environment. (see https://www.osha.gov/pls/oshaweb/owadisp.show_document?p_id=10106&p_table=STANDARDS for more information). The OSHA standard for lab chemicals also requires employers to routinely monitor their employees for chemical exposure. According to the OSHA’s official website, employers “must periodically measure employee exposures to harmful substances if you suspect that these exposures are routinely above the action level (i.e., the threshold for increased compliance activities such as air monitoring and medical examinations).” However, monitoring is only required when the chemical levels are above the “action” level. Chemical must be clearly stated on the label. Manufacturer’s name and address must be displayed on the label. Hazard warning must be written in English and include words, pictures, symbols, or a combination of the three. 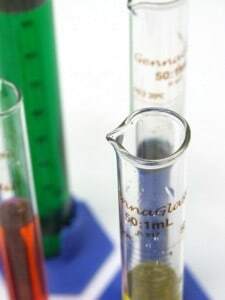 It’s not uncommon for laboratories to use beakers, flasks and other secondary containers to transfer small amounts of chemicals to and from different locations. Normally, these secondary containers are not required to possess a label; however, there are certain instances when the OSHA regulations may include them. The worker who made the transfer does not use the chemical in his or her shift. The worker who made the transfer exits the area. The secondary container is moved to a new area.